TABARRE, Haiti, Mar 7 2012 (IPS) - Complete with gallery and garden, the 534 wood and plasterboard houses are arranged in neat rows on a gravel plot of former sugarcane land northwest of the capital. At first glance, all seems normal in this new community, or as normal as anything has been in a country that suffered a 7.0 earthquake 26 months ago. In most camps, refugees complain because they are still living in tents. Not here. At the Tabarre Issa camp – built by the Irish humanitarian organisation Concern Worldwide for a total cost of over three million dollars – the complaints centre not on the new 5,000-dollar “transitional shelters” that serve as homes to about 2,500 people. Instead, they target the new-fangled “ecological toilets” inside their homes: one in each of the 534 homes meant to last three years. “No! I am not used to that sort of thing! No! This is not possible!” said resident Sherline Aldorage about the “UDT” or Urinary Diversion Toilet that came with the two-room home she moved into last year. In the Cul-de-Sac plain west of the capital, the water table is very close to the surface. The state agency responsible for water and sanitation – the National Directorate Agency of Water and Sanitation (DINEPA in French) – is concerned. "DINEPA has forbidden people to dig pits for their flush toilets," Johanne Laroche, local liaison for the city of Tabarre, told HGW. "We recommended to all NGOs (non- governmental organizations) use the "TUFF TANK" (giant, easy to empty plastic container) in their camps to avoid contaminating the water table which is very high in that region." But there are no organizations working at Tabarre Issa. Concern is gone. Tabarre City Hall and DINEPA don’t know what to do. "We don’t have any money left, the NGOS are pulling out," Laroche said. "We know that should prohibit people from digging pits, but where are they going to the bathroom?" Repulsed by the process, Aldorage ripped the gift toilet from its foundations and threw it away. Worse, she and scores of her neighbours have replaced them with flush toilets that empty into pits they’ve dug themselves into the former farmland. Camp residents’ refusal to use the UDT system does more than highlight the risks run by aid organisations who fail to get beneficiaries on board a project, it has created a new risk that threatens to spread beyond camp boundries. Tabarre Issa is not out in the middle of nowhere. It sits right atop the aquifer that supplies much of the capital’s water supply; dozens of trucks fill up in Tabarre every day. The human excreta landing in the unlined pits likely carries various pathogens and, because of Haiti’s October 2010 cholera outbreak, it may also carry the vibrio cholera germ. The potential health consequences are immeasurable. But Tabarre Issa residents appear to be more concerned about their immediate situation. The president of the camp management committee, Jean Auguste Petit-Frere, shares Aldorange’s sentiment. A survey conducted in January by Haiti Grassroots Watch (HGW) of 50 families of the Tabarre Issa camp – about one-tenth of all residents – uncovered three major complaints: odor, pollutants and cockroaches. And it uncovered much worse: Only two percent of them actually used the UDT toilets and most – 90 percent – said they had already replaced them with flush toilets. Why such distrust – revolt even – against a system which has been proven to be effective, and accepted, around the world? Certainly, ecological toilets are a novelty in Haiti and require some maintenance. But it is also true that beneficiaries have ingrained sanitary habits and these toilets – for all their ecological logic – demand that people learn new habits. Concern hired a trainer – Maryse François – to explain to Tabarre Issa residents how to use the new ecological toilets. But she herself was never able to master the system. Concern Worldwide – which has been working in Haiti in many domains since before the earthquake – knows about the problem, but notes that the UDTs were the only toilet option for camp residents, who asked that each small house be equipped with a private privy. “It’s a transitional shelter, its not a permanent residence… if you look at the options, to put in a flush toilet… the feasibility of it is not there because of the cost,” Concern’s Nick Winn explained. “If we had wanted to install the necessary water system, we would not have been able to convince a donor,” Concern assistant director Jean Frenel Thom added. Rather than 5,000 dollars each, the cost per house would have gone up to 7,500 dollars, according to Thom. But if Concern gets a 100 percent grade for hygiene, it gets a zero percent for participation. And there lies the fatal flaw: the Irish organisation appears to have failed to involve the population in its choice of the new toilet system. All 50 of the displaced families questioned by HGW said that they had not been consulted. The need for community participation in development projects – and especially ones involving personal habits – is well established. Study after study recognise that the idea of new toilets should be culturally accepted by the recipients first. Concern doesn’t deny the allegations, but condemns the actions taken by residents. “They took it upon themselves to replace the systems that were installed in their homes. Is it Concern’s place to prohibit them from doing this? They’re just replacing them. We can’t do anything about it because officially, Concern doesn’t manage this camp any more,” Thom explained. One of Concern’s partner organisations, the U.S.-based Sustainable Organic Integrated Livelihoods (SOIL), which works in ecological sanitation, was well aware of the environmental danger. At meetings and in emails, SOIL repeatedly warned Concern about the inherent complexities of getting 534 families to accept UDTs. Concern contacted SOIL just three weeks before the toilets were to be completed, asking for help. The organisation turned down the request, saying that an effective awareness campaign was impossible to complete in only 21 days. Winn conceded that many camp residents don’t use the UDTs. “They could be more successful. Definitely… the use could be better,” he said. And with its 534 homes and their gardens, the camp is not “a failure”. Not surprisingly however, Concern has changed its practices for other camps. But the improvements are for other camps. It’s too late for Tabarre Issa. But do Haiti’s weak and underfunded authorities have the resources necessary to address the serious environmental threat that hangs over this major water resource for the capital? *Haiti Grassroots Watch is a partnership of AlterPresse, the Society of the Animation of Social Communication (SAKS), the Network of Women Community Radio Broadcasters (REFRAKA) and community radio stations from the Association of Haitian Community Media. It is the second of a two-part series on water and sanitation problems in Haiti. Pic is a lie! 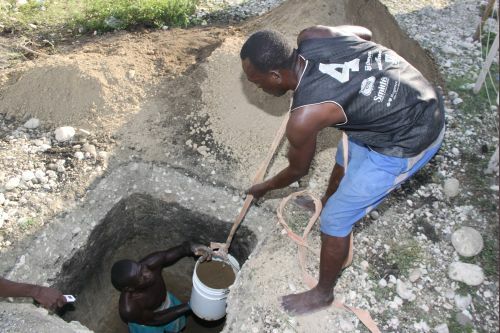 Look at the photo, the guy is cleaning out an existing septic by hand, the bucket is not full of dirt, I guarantee it!